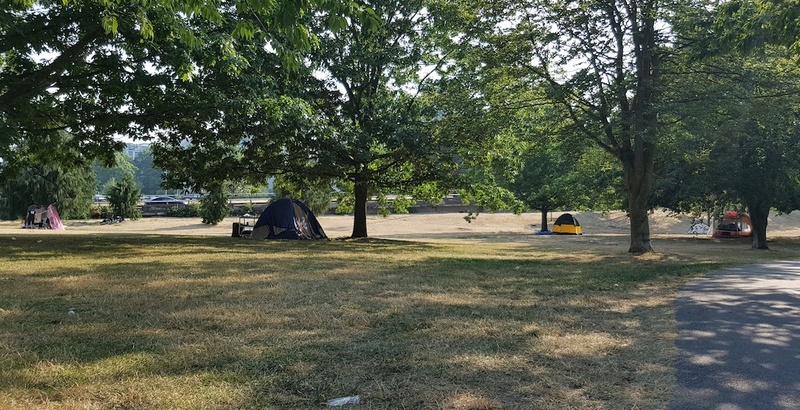 The City of Vancouver says a large green space on the easternmost end of the Dunsmuir and Georgia viaducts is proposed to become a temporary modular housing development for the homeless. This site has an address of 898 Main Street, but it is located on the other end of the block at the southwestern corner of the intersection of Union Street and Gore Avenue. It is anticipated it will create modular units to house about 50 people, which will completely fulfill the City of Vancouver’s goal of creating 600 temporary modular homes. The green space at the southern edge of Chinatown is covered with grass and has trees, but it is not an official city park. It is already a popular area for homeless encampments. “With the latest potential housing site at Union and Gore, we will meet our goal of 600 temporary modular homes across Vancouver,” said Mayor Gregor Robertson in a statement. There are currently 208 modular homes in various stages of development and approval, according to the City. The cost of constructing the homes is $66 million and it is being funded by the provincial government. As part of the approved Northeast False Creek plan, the municipal government already has longer-term plans to redevelop the site after the viaducts are demolished. This particular green space is envisioned as a part of the city-block-sized Hogan’s Alley redevelopment, which includes permanent social housing and retail and cultural spaces.